SNLD lawmaker Sai Thiha Kyaw shares his thoughts on what the NLD government could achieve for Shan State and what issues he will address. NAYPYITAW (Myanmar Now) – Sai Thiha Kyaw is a two-term lawmaker in the Lower House representing Mongyai Township in northern Shan State. He became an MP in 2011 as a member of Shan Nationalities Democratic Party (SNDP), but ran in the 2015 elections under the banner of Shan National League for Democracy (SNLD). The SNLD won 25 Shan State parliament seats and a total of 16 seats in Myanmar’s bicameral union parliament. 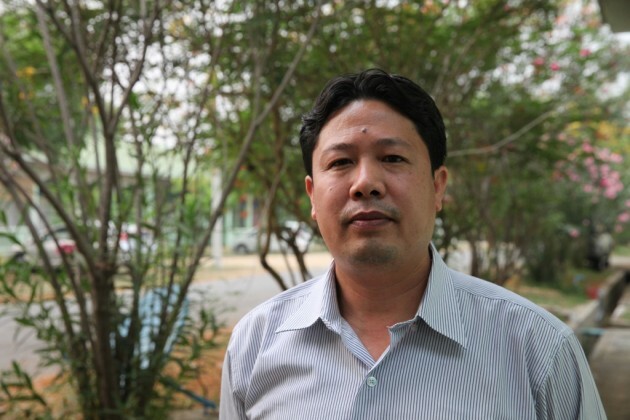 In an interview with Myanmar Now, the 41-year-old discussed the SNLD’s expectations for the NLD government and parliament, while he also talked about development plans for Shan State, and the ethnic conflict raging in the state’s north. Question: What are the SNLD’s expectations for what it can achieve in the new parliament? Answer: Our party’s main policies and expectations include equal rights, self-administration and a federal union, all of which are the desires of the ethnic groups. Amending the Constitution is crucial to achieving these goals. In order to do this, you have to work both within and outside the parliament, such as by holding political discussions and negotiations, and political dialogue resulting from the nationwide peace negotiations. We could not expect this in the previous parliament as we didn’t have enough seats. But now we’ve reached a certain stage in the political dialogue and the winning party, the NLD, has entered parliament saying it wants to amend the Constitution. That’s why we attend this term of parliament with high hopes. Q: Previously, the USDP dominated the parliament, but now it’s the NLD. Does the continued dominance of a single party concern you? A: Yes, I am concerned to a certain degree. During the term of the USDP, we wondered to what extent they were committed to reforms and whether they would implement them. But it was about just trying to get involved in the process. This time, the NLD won the majority, and as it begins to govern it has taken some contentious steps. For example, there’s a view (among ethnic leaders) that the state and regional chief ministers should be given to people from (the dominant ethnicity in) that state and region. But the NLD appointed its own people (by using the Constitution’s centralising powers). So it is a concern that a group that has objected to the Constitution before is now using the Constitution. Q: The NLD has talked about national reconciliation and selected Kayin, Kachin, Chin and Rakhine people, mostly from within the party, for leading government and parliament posts. But why are there no Shans involved? A: After the NLD won a landslide victory in the elections, people thought Shan politicians should get some of these posts as we are allied with the NLD. The NLD did approach us for positions in both the union and state government. I’m sure you heard that we refused their offers because of the situation within the party and at the moment, we are not ready for the executive positions. However, our headquarters has instructed us to cooperate with NLD parliamentarians. So, we will support them in parliament even though we do not take part in executive roles. There is no problem between the NLD and SNLD. Q: Many civilians in Shan State are fleeing from conflict-affected areas. What could be done to bring real peace? A: We need to review why these armed groups fought against the government for so many years. They are asking for genuine federalism… To achieve a real federal system, there must be a clear separation of powers held by the union government and state or region governments. Chief minister should be appointed by the regional or state parliaments (and not the president). The judicial sector in the states is also under the control of union chief justice. This is a centralised system, not a federal system. Q: How should the NLD, which has emphasised the need for rule of law, deal with Shan State’s many militia groups under the military’s control? A: Well, rule of law is easier said than done. There is no ‘rule of law’ in the areas controlled by armed groups in Shan State. That’s why they were urged by the government to ‘enter the legal fold.’ However, their decisions depend on their trust and expectations. If they don’t believe in peace, they will keep their weapons. Both the government and the military play a key role in this issue. Political talks needs to be held with (ethnic) armed groups. For the militia groups, they are under the control of army now. So, if there are any instances where they mistreat the people, then the army is accountable for them. Q: What should be the plan for the development of Shan State in next five years? A: The core issue here is peace. And education levels in the area are also low; while drug abuse is spreading. Millions of young people from this state are migrating to neighbouring countries such as Thailand and China. These are the consequences of civil war. Upgrading transportation, creating business opportunities and better telecommunications will help develop the region. Five years ago, there was no telephone landlines or mobile phone networks in my constituency; electricity was available for only two hours a day, and the road network was poor, even though we are located at the intersection of four roads. Now, the area has 24-hour electricity, improved economy, and better transportation and telecommunication systems. Q: What will you prioritise during your five-year term? A: There are land rights issues to address. There have been many land dispute cases in other places, but at first I wasn’t too worried because there was only one case my constituency. Then, they multiplied. I made a complaint to the parliamentary investigation commission on land confiscation, but they ignored my requests to visit my constituency. At that time there was only a single case in my constituency. In the end, I quit the commission to address these complaints on the ground. After all, I’m an MP because of the votes from my constituents. So I came back and helped the locals get back 75 percent of their confiscated lands. The support of central government plays crucial role in our work. Q: There is also growing concern among Shan State communities over planned hydropower dams, in particular on the Thanlwin River. How should the new government deal with these concerns and projects? A: A good attitude is important for the new government in making its decisions. Myanmar doesn’t generate sufficient electricity (for its economy). This sector must be upgraded, but this should be done systematically. At the moment, it looks as though the preference is for big projects. Although the projects are big, the benefits are low. Many people do not want to accept this. If the dams burst, people nearby will suffer losses. Yes we want electricity, but if it means we have to sacrifice our lives and livelihoods, we’d rather stay in the dark. Other developing countries built some small dams instead of mega dams to avoid environmental degradation. But if the project is small and of low value, authorities are not interested. Questions should be raised as to why they refuse to set up these projects. *This article first appeared on Myanmar Now on 9 April 2016.